Priced to sell! Hurry! Stunning panoramic bay views on oversized triple-lot paired with a huge 45 ft. Lap pool. Large spacious family home ranch home with tiki doc and boat lift. Great location with no bridge noise. Beautiful 3/3 w/den or office ranch pool home with split floor plan in desirable sw cape coral on a quiet cul-de-sac. Double garage and a 20,000 - pound covered boat lift and dock with direct sailboat access on a canal that will have you in the river in minutes and then out to the gulf! Newly remodeled with large covered lanai addition. Pool resurfaced, new pavers and new cage that includes a large covered area and an outdoor shower added in 2016. House completely remodeled in 2016 and new hurricane windows, furnace and roof installed in 2017. Close to tarpon point and not far from the active downtown cape coral community. Open floor plan, vaulted ceilings, gourmet kitchen, large counter bar , outdoor bar seating and commercial grade refrigerator and freezer make this the perfect home for entertaining or just cozy up to the large fireplace in your year-round or vacation home. Perfect for seasonal rental as well. Beautiful 3 bed/plus ranch w/vaulted ceilings. 8 ft. Doors throughout 2,437 sq ft office, den, 2 full baths, 2 car garage. Large granite kitchen w/ long island bar. Open concept to kitchen, living room, w/fp living & dining room have pocket sliding doors to fully open area up into the lanai. Kidney shaped salted pool w/waterfall spa. Lg/vita bathtub w/jets. Lg double vanity w/granite counter tops. Guest bath w/ granite w/tub&shower that leads into lanai 10,000 lb boat lift w/canvas canopy. Newer a/c unit, appliances. Pool converted to salt with updated electric valves w/remote. Updated landscaping. Gulf access, sw cape coral waterfront home! This courtyard style home sits on an oversized corner lot. Located in a desirable sw cape coral neighborhood, this unique ranch style home features a mother in law suite with kitchenette, refrigerator, and walk in shower. The main house, features pocket slider doors, opening to the courtyard from the kitchen. Kitchen is designed with a granite countertop island, custom cabinets, cathedral ceilings, and stainless steel appliances. The two guest bedrooms are joined together with a jack and jill bathroom. Owners suite has pocket slider doors exiting to the courtyard, transom windows, creating lots of natural light, and a tray ceiling. The spacious back deck, overlooks the water and sunset evenings. From the backyard deck step down to the u shape dock with boat lift. This home is ideal for entertaining, inside and out. The unique courtyard, has two 2 foot bridges, crossing over the pool and onto a quaint palm tree island where live orchids bloom throughout the year. Waterfalls grace the pools edge & island, creating a tranquil, private atmoshphere, perfect for entertaining! This florida home is perfect for annual, or seasonal residency! H. 13388 - brand new construction timing is everything, the sooner you act the more options you have to make this home yours with all your favorite features and colors. Brand new model quality custom built home on fresh water canal. Home features are too numerous to mention but include. Voluminous hand crafted tray ceilings throughout. 180* corner pocket slider doors allowing unobstructed indoor / outdoor living. 24x48 polished porcelain tile floors grace entire living area. Large master bedroom suite, master bathwith oversize walk in hower and separate tub for relaxing3 bed 2 bath ranch stylehome. Allowance for gourmet kitchen, you pick the decor and appliances. Have option for salt water pool and spa at buyers discretion. This is a high end custom built home. No expense has been spared. **** all windows and sliders are hurricane impact glass ****don't miss the opportunity to make this your dream home here in paradise! Pool package available!!! Make this beautiful home yours today! This fully remodeled gulf access, pool home comes complete with solar heating system, new windows, sliders, paver driveway, and tasteful landscaping. The attractive pool, located in a 14x28 rectangular in screened, large lanai, overlooking intersecting canals comes complete with a sundeck and an under truss seating area. The home comes with storm shutter protection, some accordion, on entire house and a hurricane rated garage door. Enjoy your evening overlooking the fabulous gulf access basin view with a 200 foot wide canal. Paver driveway (you can easily park 6 cars on the roomy driveway) paver lanai, custom kitchen cabinets, granite counters, split ranch style home, master bath (pool bath) and guest bath completely remodeled. Tile floors throughout the entire home. Professionally landscaped and close to shopping, churches, banks, cinema, 25 minutes to airport. Also included in this home is dual water system, all assessments paid and sprinkler system. Whole house surge protector, generator hookup. Dont wait to book a showing because this one wont last long! Northern ranch style pool home on a 4 lots site!!! Not only an amazing location but a unique home featuring a big kitchen with a formal dining room , skylights and florida room for entertainment. Screened pool, 3 bedrooms, 2. 5 baths , large workshop & extra storage that are not included in the 2,878 living area. Fruit trees in the backyard! One of the most affordable homes in the fast growing cape coral sw area! Great location closed to shopping and minutes from cape coral downtown. 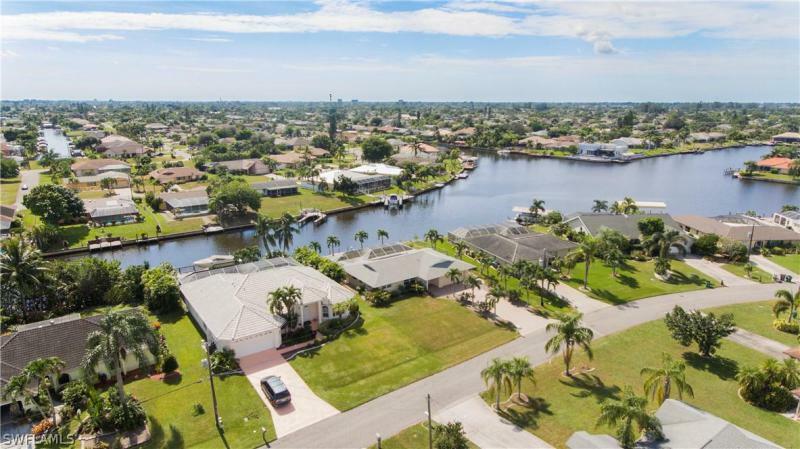 As of today, 4/18/2019 the average home price for homes for sale in Cape Coral is $165,039.